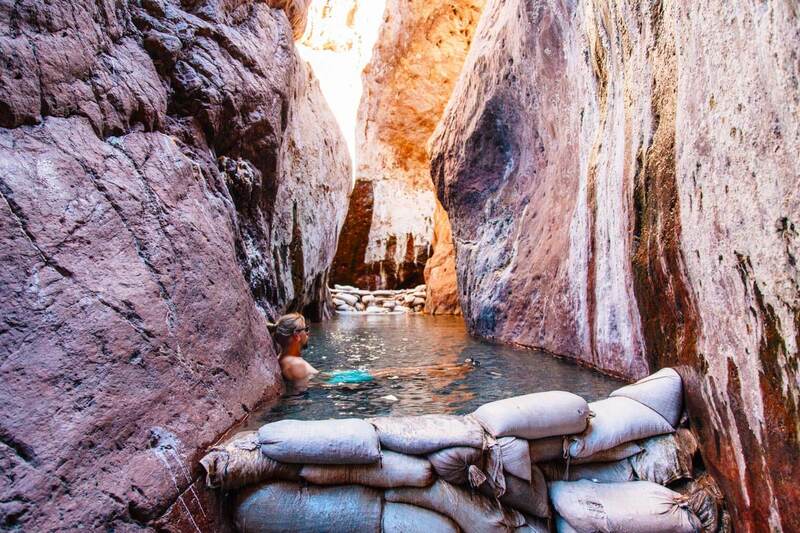 Arizona Hot Springs (aka Ringbolt Hot Springs) are located along the Colorado River just south of the Hoover Dam. 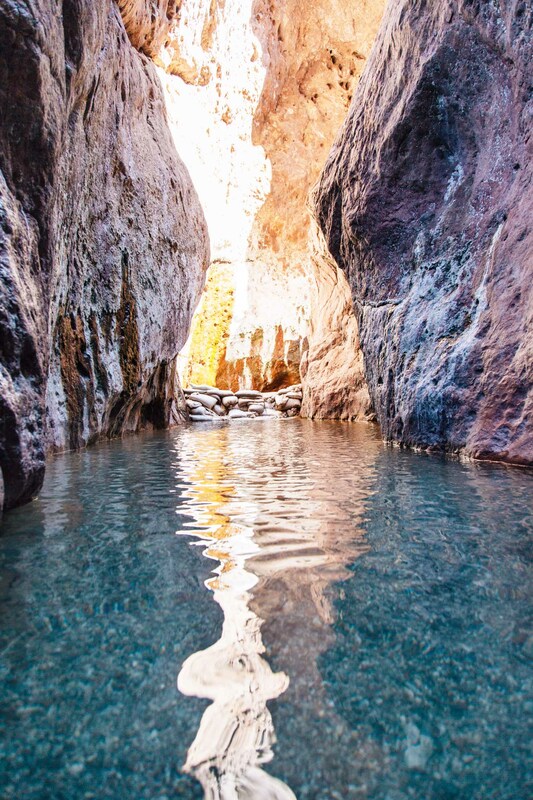 Tucked away inside a colorful slot canyon, these hot springs offer a beautiful environment to enjoy a nice long soak. They can be accessed by boat via the Colorado River or by hiking a 3.2 mile trail down from the Arizona state highway 93. For our visit, we opted to take the trail. 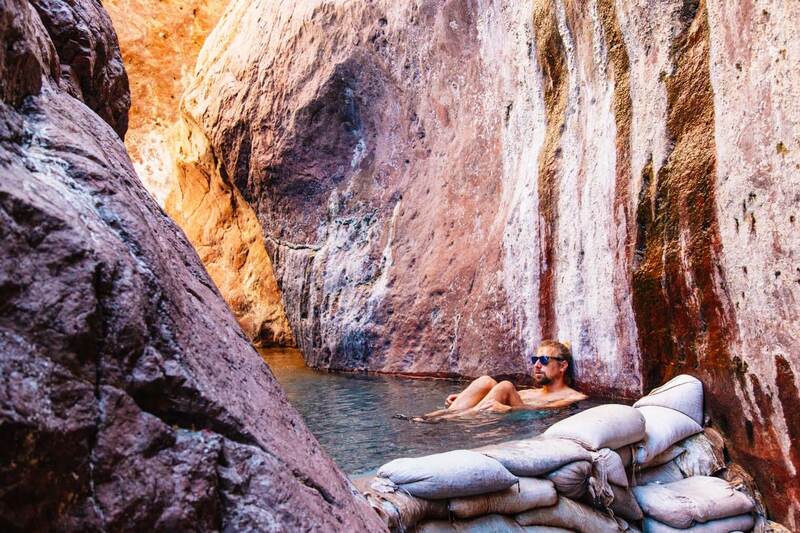 Many people visit Arizona Hot Springs as a day hike, but we planned to camp there overnight. So we brought our standard backpacking setup (i.e. tent, pads, sleeping bags, etc) along with a couple of select “extras”. Lightweight Backpacking Food – Since we needed to pack in (and out!) all of our food, we opted for lightweight, easy to prep food. 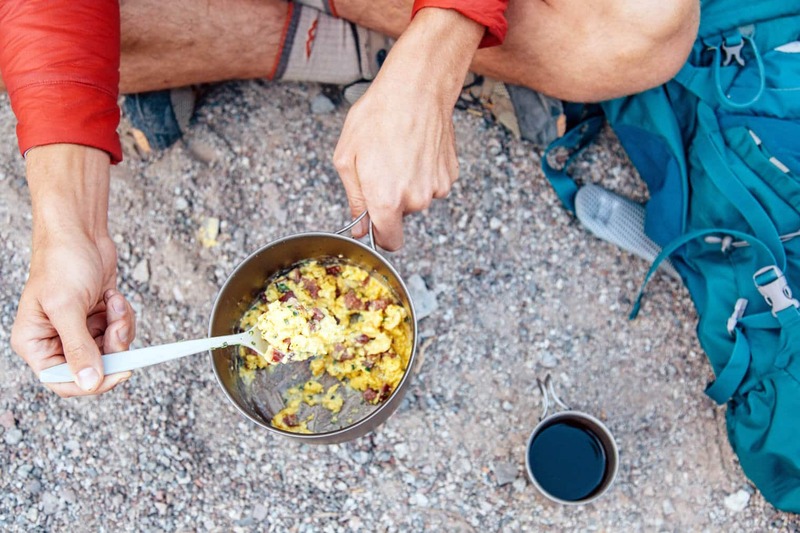 You can check out this post to see some of our favorite foods to bring backpacking. SteriPen – This portable device uses ultraviolet light to sterilize water and kill off any malicious bacteria, viruses, and protozoa. We knew there wasn’t any potable water at the campsite, but with a SteriPen we had the entire Colorado River to drink from. Merrell Moab Ventilator Boots – We brought these boots with us because the trail down is filled with sand, loose gravel, and boulders. And in a few section you have to scramble. The super grippy Vibram soles of these boots were perfect for the conditions. Chacos Z/1 – We also brought these sandals with us because they are great for climbing around slippery wet surfaces. 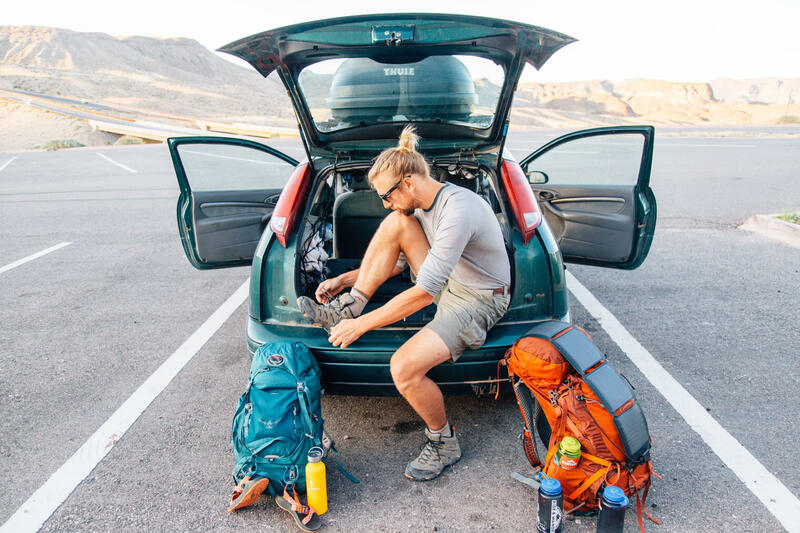 Whether we were swimming in the Colorado River or soaking in the hot springs, these are a great pair of outdoor sandals to have. The trailhead parking lot is on the north side on State Route 93, about 3.5 miles south of the Pat Tillman Bridge. The weather was forecasted to be very hot, so we arrived early to get on the trail before the sun got too high. But even at 7am, the air was already pretty warm. At the end of the parking lot, there are signs warning hikers about the heat. There have been so many fatalities here from sunstroke and dehydration that the trail is actually closed from June through August. Since the trail is relatively short, people tend to underestimate it. But it’s completely exposed nearly the whole way down. Despite these ominous warnings, we did have one fortuitous sign. In the completely deserted parking lot, somebody had left a disposal cooler containing beer and rapidly melting ice. We helped ourselves to a couple “trail magic” beers to enjoy at the end of our hike, and started our descent down. 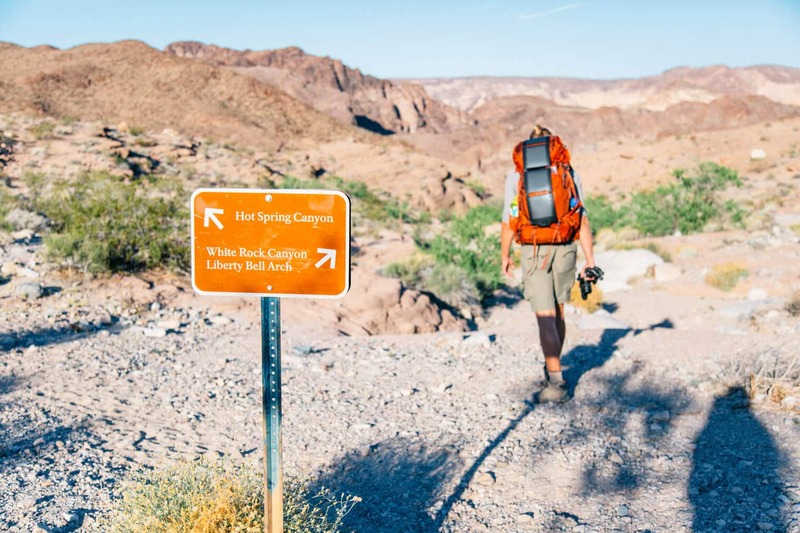 You can find a map for the Arizona Hot Springs hike here. The trail begins by taking you underneath the freeway and down a gravel filled wash. From here, there are two ways of getting to the hot springs. Hot Spring Canyon approaches the springs from behind and White Rock Canyon will allow to approach the springs from the river. We decided to go down White Rock Canyon and return back via Hot Spring Canyon. Shortly after the wash, we quickly descended down into a high-walled canyon. The sun was still low enough on the horizon that this section remained almost entirely in the shade. We meandered down the loose gravel trail for about an hour and a half before we arrived at the banks of the Colorado River. Here we had to turn left, but while one might expect the trail to follow the river, it actually cuts inland in order to get up and over a ridge. There are signs marking the way, even though the topography makes identifying the trail a little difficult. In a few areas, we had to scramble our way up and over a narrow rocky crack in a cliff. This was a little tricky with our overnight packs, but we managed to crawl our way up. At this point the sun was getting pretty high in the sky and we were starting to get the classic backpacker back sweat. Thankfully we were nearly there. We descended into a gravel wash of Hot Spring Canyon and followed it down to the river. Here, we found a dozen kayaks, rafts, and canoes that had been pulled ashore on a semi-protected beach. A local tour group had just landed and was in the process of setting up camp nearby. There were also a few people who had arrived by power boat from downstream. With its flat open area and proximity to hot springs, this beach is a fairly popular camping destination. If you’re visiting on the weekends, be prepared to have a little company. The weather forecast was calling for high winds during the evening, so we spent some time scouting out a good place to pitch our tent. There were plenty of spots inside the canyon, but the way the cliffs channeled the air, we felt it was actually more breezy there than by the river. So we decided on a secluded spot, tucked away in a thicket of brush. While there bushes didn’t offer much shade during the day, they did an excellent job of buffering the wind that night. Despite the easy access from the river, this is backcountry camping. Which means no trash, no potable water, no designated campsite. The one exception are the two vault toilets setup just to the south of the beach. These were extremely clean and well-kept, as they are serviced by a park ranger about every week. When we arrived, the ranger was just leaving. One sour note of the experience, was the amount of garbage we saw. Despite the signs urging people to Leave No Trace and Pack It In, Pack It Out, there were some areas that looked completely trashed. And not just an errant candy wrapper or empty water bottle, but entire campsites where the previous occupants had apparently thrown all their trash on the ground and just left. It truly breaks our hearts to see such carelessness and disrespect for the natural environment. If you enjoy the outdoors, we highly recommend doing a little reading about Leave No Trace. The Pacific Crest Trail Association has a great write up that outlines best practices for camping in the backcountry. After setting up camp, we threw on our bathing suits and made a trek up to the hot springs. As we hiked up the canyon, we found a trickle of warm water that was flowing down. The further up we went, the stronger the stream became and warmer the water got. In a few areas, we had to shimmy up a slippery rock chute as warm water rushed down it. The trail dead ends at a 20 foot waterfall, but a ladder has been rigged up so you can access the hot springs located above. While securely fastened to the cliff, the rungs of the ladder were wet and slippery, making the final dismount at the top was a little tricky. Here at the top, is where the first of the hot springs pools begin. Gravel filled sandbags have been stacked to create artificial pools to prevent the water from just rushing down the waterfall. The first pool is the coolest, but as you progress up the canyon they get progressively warmer. The top pool, which is closest to the source, runs at about 110 F degrees. Near the hot springs there are also signs about Naegleria Fowleri – also known as the brain-eating amoeba – which can be found in thermal pools such as these. If present, the amoeba can travel up your nasal passage and cause a fatal infection. While such infections are extremely rare, with only 130 cases being reported to the CDC since 1962, it is still advised that visitors refrain from putting their head underwater. While these hot springs are beautiful, they are wild, and a certain degree of caution must be exercised when visiting them. Since it was a warm day to begin with, we couldn’t handle the hotter pools at the top, so we spent most of our time hanging out in the lower pools. There we reclined in the clear water and listened to the sound of the waterfall echo down the canyon. While it was very exposed down by the beach, inside the canyon we could relax in the shade. Finally after a good long soak, we headed back to camp. Having hiked in via White Rock Canyon, we decided to hike out via Hot Spring Canyon. This actually takes you through the hot springs, so if you’re going this way be prepared to get your feet wet. The water inside the pools isn’t much more than knee deep, but they can get pretty hot towards the top. We hiked through in our sandals and then switched back to our boots. The hike back to the trailhead via Hot Spring Canyon was about a half mile shorter, but it was much steeper and far more exposed. The canyon walls aren’t as high as White Rock, so even the morning sun was peeking over the sides. Thankfully it wasn’t as hot as the first day. The Arizona Hot Springs have got to be some of the most interesting springs we’ve visited so far on our trip. 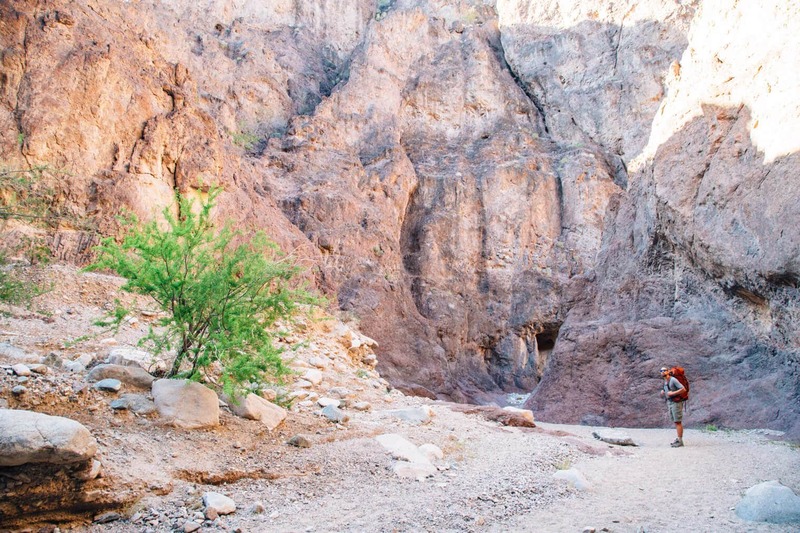 The hike to them was pretty incredible, the campground was right on the Colorado River, and the springs themselves were hidden away in an amazing slot canyon. If you’re in the area, we’d definitely suggest checking it out. But while this place is beautiful, it is a fragile environment, so enjoy responsibly. Fresh Off the Grid is a culinary resource for the outdoor community. We offer a collection of recipes, how-to guides, and camp cooking gear to help elevate your outdoor experience through food and drink! How long is the entire trail ? The trail is 3.2 miles. Hey, I hike this trail a lot and am contemplating spending the night. I just really have one question…what is the critter situation out there at night? One thing I hate about living here is that if you go out at night you encounter roaches (aka waterbugs) and scorpions. Since you went in warmer weather, did you have to deal with these guys at all? We didn’t see any critters, but I wouldn’t be surprised if there were some out there. Snakes and scorpions are definitely a possibility out in the desert. While all the human activity in the area might scare off some animals, others animals (e.x. coyotes) might be attracted to food and trash. great post, informative and responsible jounalism! may i suggest supporting the craft beer movement in future adventures? Thank you. We have since switched to drinking Montucky. 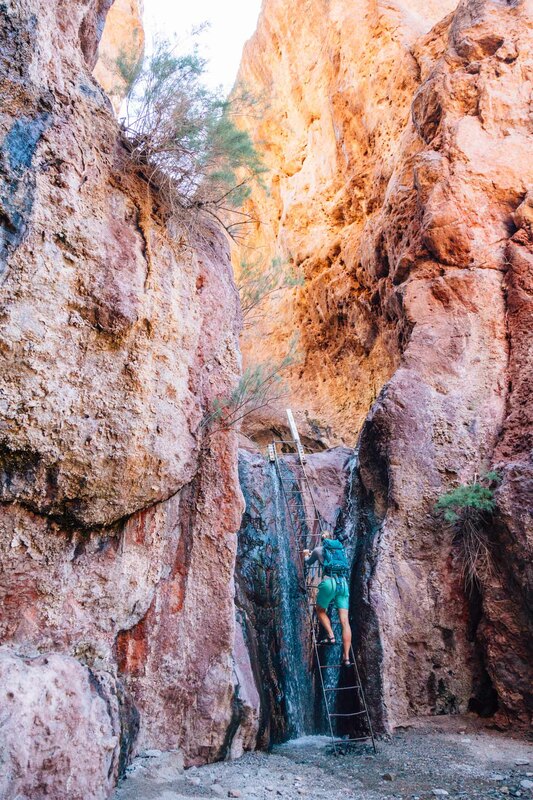 I am an Arizona Native and have had this little adventure on my list for a while! I just started a blog so I suppose that gives me an excuse to pack up and just go do it! Your article is super helpful in that as well as the formating for how I would someday like to blog! As a regular visitor to these springs they are an incredible spot. I often hike to the springs at night after work. With or without a moon, it’s an incredible night hike. It’s unfortunate how much trash people leave and a handful of regulars and myself are constantly bringing it out. Even things like orange peels people don’t realize how long they actually last in the desert. There is also an area right above the springs that makes for a great campsite. Usually there isn’t anyone camping there and that also means the springs are only 100 yards away. Much closer than if camping at the river. That looks like so much fun! And not to mention your photos are beautiful. 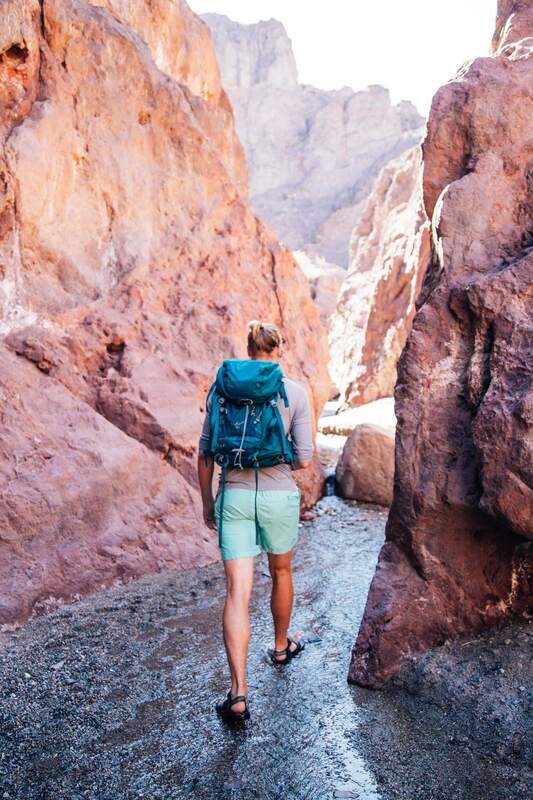 I agree, Chacos are a must-have for hiking. I actually broke through two pairs when I was down in Brazil! This is a great and helpful post, thank you for sharing! I have a question about tents and sleeping bags … a friend and I are planning a camping trip (short, one or two nights) but one that requires us to travel cross country (plane) with our backpacks. We wanted to keep the load light so are looking to purchase excellent sleeping bags and tents (probably a 2 person tent) that are small and can fit in the pack, also semi budget friendly. Out of curiosity, which do you carry? 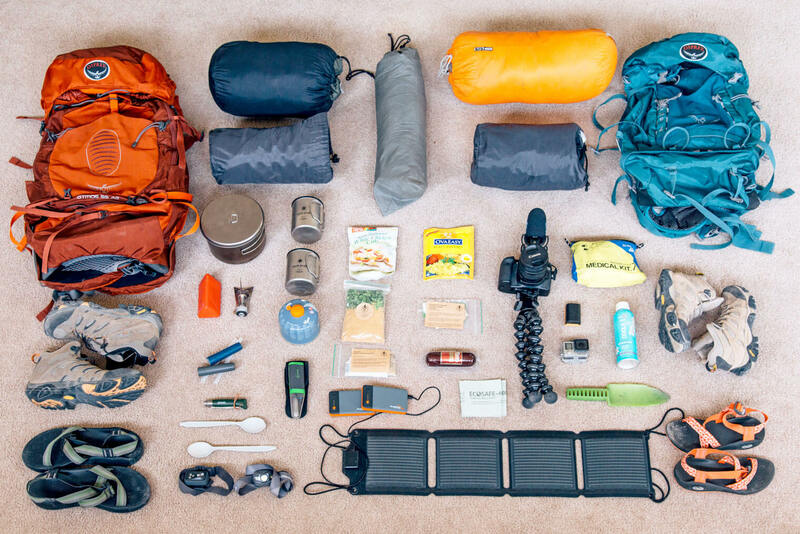 Or do you already have a post outlining your gear? Thank you in advance! Hi Liz! We don’t currently have a post outlining our gear, but here’s some of the stuff we carry + why we like it! Sleeping bags: Sleeping bags tend to become more expensive the lighter they are, so you’ll have to strike a balance on that front. If you’re just front country camping and aren’t camping anywhere particularly cold, you could probably get away with a 2 season bag, which will be lighter and budget friendly. Michael had a Marmot bag for a long time that he liked a lot, I have a Sierra Designs bag which I enjoy but their bags can be a little on the pricey side (something I was willing to do since it was for a month long backpacking trip several years ago). Tents: For front country car camping, the two tents we have used recently would be way too bulky to take on a plane. However, we’ve used our backpacking tent on a number of occasions even when car camping to save space. For the last four years, I’ve used a Tarptent Double Rainbow, which is big enough for two people (incl. Michael who is 6’6″). I love this tent except for one aspect: It’s a single wall (to save on weight + bulk), which means that is is very prone to condensation. That being said, if it’s not forecasted to rain, you can set it up in a way that promotes air flow which helps cut down on the condensation issue. 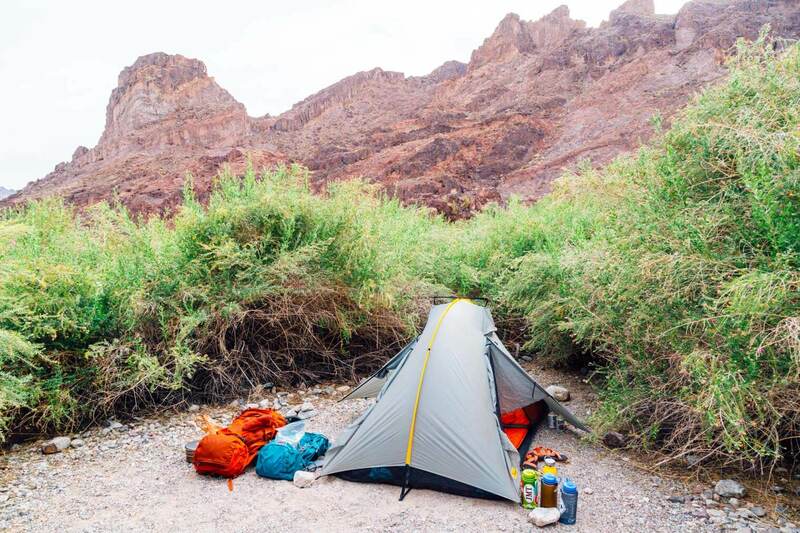 Tarptent makes a bunch of different backpacking tents so there might be a different model that will work best for you. My JMT hiking partner had a Big Agnes UL tent that he really liked and I don’t think he had as big of a condensation issue, so you could look into that one as well (though I think those can get a bit pricey). If you’re not backpacking, another option which would be much more budget friendly could be to pick up a cheap tent from an Army surplus or Target in the area where you’re camping, and then donate it after your trip (local youth organizations like the YMCA, Girlscouts, or Boys & Girls clubs usually have a need for things like this!!!). That way you don’t have to worry about the weight + bulk while flying, but also don’t have to pay an arm and a leg for a lightweight tent. Hope that helps! Let me know if you have any other questions! This looks like a great place for a mid-week overnighter – I’m definitely going to bookmark this one, thanks! Hah! Loved that you made mention of the tell-tale “classic backpacker back sweat”. And, of course, loving all these stunning shots you got! So disheartening to hear about the trash situation you encountered, it’s always such a shock to see such flagrant disregard for nature like that. But so HEARTENING that you’re sharing all your hard-earned knowledge about Leave No Trace and promoting better practices! Going to have to make a mental note about Fireside Provisions for our upcoming road trip through the parks this summer, sounds like it could be a game-changer! Yeah, the trash situation was a real bummer, but I’m glad that we have the opportunity to open up a discussion about the topic. While I have a hard time believing that folks trash outdoor spaces because they “didn’t know any better,” I do think that the more the issue is brought to light, the more likely people will think twice before leaving an entire weekend’s worth of trash scattered around their campsite when they pack up to leave. Love this post, nicely done! 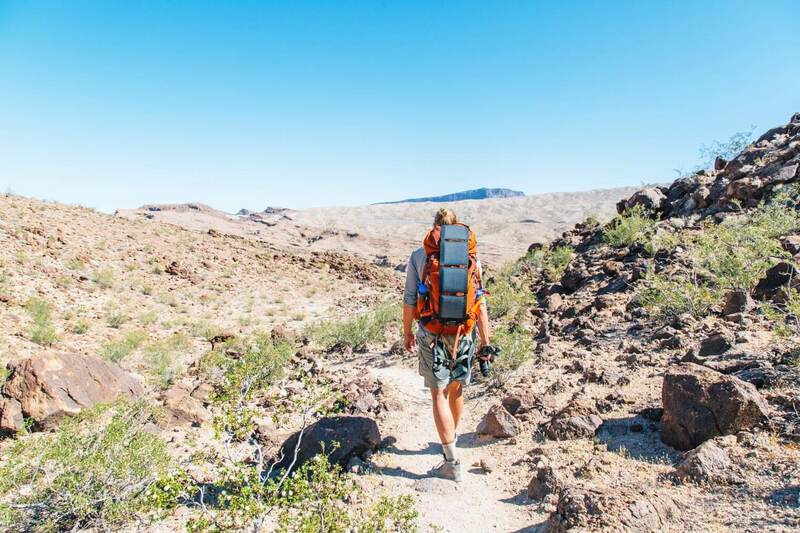 Curious, which Osprey packs do you like for backpacking? I am going to check out Fireside Provisions! Thanks Jordan! Michael has the Atmos AG 65, and I have the Kyte 46. Michael LOVES the AG system on his pack – I really wanted to love it but the hipbelt didn’t work for me. The Kyte is great, but it would definitely be a little on the small side if we didn’t split gear and I had to carry a bear barrell in it. It’s definitely possible if you’re a bit on the minimalist side, though. haha magic beer find!! Nice! Looks like you guys had the place to yourself 🙂 Its such a bummer that people will just purse out these beautiful places – pick up your chip bag dudes! We arrived pretty early on a weekday, so we did get it to ourselves for a little bit! (The weekend was a different story!) I know, it really is such a bummer. I really just DON’T understand how someone could want to spend time in nature, to the point where you have to hike 6+ miles RT to get to a place, and then trash it. Like, WHAT?